So, the first half of baseball’s 2014 season went exactly like we predicted, and by that I mean it went absolutely nothing like we predicted. The Nationals have the best and most complete roster in baseball. Yet, as opposed to running away with the division at the halfway mark like most thought they would, they’re tied with the Braves for the division lead. The Brewers were supposed to dutifully play the statue to the Cardinals’ bird, but even though they’ve lost 10 out of their last 12, the Brewers went into the break with the division lead. But, unlike other industries that might get out of the prediction business once their picks turn out to be wrong, we in the sports media wear our ineptitude as a badge of honor, and double down by making even more predictions! So, set against the backdrop of industry-wide fail, I present you with five things that will probably not but totally could happen in the second half of the 2014 season. There’s no greater player in MLB this year in a more dysfunctional situation than Troy Tulowitzki. The Rockies are a basket-case run by an owner who is actively telling fans not to come to games. Nor have there been many more direct messages sent by a player than the one sent by Tulowitzki when he told reporters that he “doesn’t want to be Todd Helton.” Translation? Tulo has no interest in staying in Colorado, and would jump at the chance to be traded. Of course, it takes two to tango. Tulowitzki can pine for a trade all he wants. There has to be another trading partner out there, and right now the chances of finding a dance partner look slim. The Cardinals, Orioles, Cubs, Astros, and Dodgers have the kind of collateral down on the farm to swing a deal like this. St. Louis would make a ton of sense, especially when you consider that after all the things that have gone wrong for them in the first half, they’re still only one game out of first place. Michael Wacha returning sometime in the next few weeks will help the rotation. There’s not a ton the Cards can do to make-up for the loss of Yadier Molina from a catching standpoint. But the Cards lost more than just a catcher when Molina fell to the DL. They lost a lot of pop in their line-up as well. Tulowitzki would fill that void nicely. Yes, I know. Abreu has hit 29 home runs through 96 games, and only needs 21 more with 66 games remaining on the schedule. I’m also aware that he hit double-digit home runs in the months of April and June. But here’s the thing that few, if any are aware of: Jose Abreu, prior to this year, had never played more than 94 games in a season, which he did for his Cuban club. We simply have no way of knowing how Abreu will react to the kind of intense and sustained campaign of a 162-game season. The MLB regular season is a grind unlike any other regular season in major American sports. Abreu is a freakish talent, and will do great things in this league for a long time. But this record will elude him. It makes all the sense in the world, a last placed team in possession of a bona fide ace with significant post-season experience that could help out a playoff contender immediately. But even though all those things apply to David Price and the Tampa Bay Rays, I’m still selling on this deal getting done. 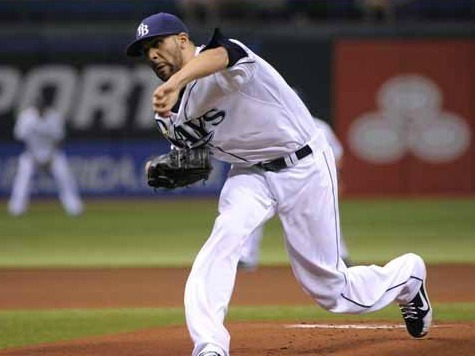 For example, one of the teams in need of David Price is the Baltimore Orioles. The Rays would never trade Price within the division. Another team in need would be Milwaukee, but the Brewers just called up one of their best prospects to replace Marco Estrada. You’ve got to believe the Rays would have wanted a top prospect in return for their franchise ace. Also, the AL East is an awful division. Even though the Rays are 9 ½ games back, I’m not convinced that they believe they’re out of this. The Orioles and the Blue Jays are highly suspect in multiple areas. The Rays are in rough shape. But the division is so bad that it’s not inconceivable that they could come back. In fact, it would in no way shock me if the Rays came back and won that division. For that reason, the Rays will play it safe and hold on to their ace. This is the year Billy Beane has been waiting for. This is the reason why he didn’t take the Red Sox job years ago. Moneyball was a system designed for small and mid-market teams to collect cost-efficient players in order to compete with and eventually beat the big market teams. Going to Boston would not have proven that. Boston is the definition of a big market team. This year’s A’s squad is Beane’s best chance to get that done. The A’s had only one potentially fatal flaw in the first half, and that was the lack of durability and experience in their pitching rotation. The blockbuster trade the A’s pulled off weeks ago to add Jeff Samardzija and Jason Hammel gave Oakland the postseason pitching credibility it needed. They still have to take it. But, it’s theirs for the taking. Seems impossible, I know. But if you look at the teams that are struggling this year most of them are struggling or underachieving due to major injuries. Others are teams with managers who have built up some good capital. The Red Sox are awful. But certainly no one is going to fire John Farrell one year removed from winning the World Series. The Cardinals are struggling, but no one is going to fire Mike Matheny one year removed from a National League Championship. The Rays are tied for last place in the worst division in the American League, but are the Rays really going to fire the smartest manager in baseball? Not a chance. I will insert one disclaimer: if there was a manager to be fired after this year, it would be Kirk Gibson. The Snakes are bad; not that all of that is Gibson’s fault. But many feel he’s not done enough to right the ship. Add on to that the arrival of Tony La Russa. Executives in charge of organizational makeovers normally seek to bring in their own people immediately. Things don’t bode well for Gibson. Dylan Gwinn is the host of The Mighty Gwinn Show heard on Yahoo! Sports Radio every Saturday and Sunday from 1-5 EST. Follow him on Twitter @themightygwinn.